I read an article in the Sports section of The Washington Post this morning about the U.S. women’s national soccer team. The article was about Coach Greg Ryan making a change of goalie on the eve of their World Cup semifinal match with Brazil. Talk about foreshadowing! I thought that making a switch wasn’t a good idea as the author of the article, Steven Goff, hinted. On my way to the office, I heard the score was 2-0 Brazil. By the time I got to the office it was 3-0. And the final ended up being 4-0. Turns out changing keepers might not have been the best idea. 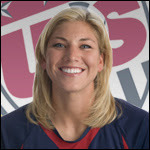 On the way home this afternoon I heard an interview with Hope Solo, the goalie who was benched. She called out the coach for making the change! Here’s a snippet: “It was the wrong decision, and I think anybody that knows anything about the game knows that. There’s no doubt in my mind I would have made those saves. . . . You have to live in the present. And you can’t live by big names. You can’t live in the past.” Good for her! 1) I consider soccer not only a sport, but a good one. 2) I have three daughters who may one day play soccer. 3) I know probably not many people are blogging about this, much less men blogging about it, and I don’t care. It irks me when people make stupid decisions and replacing a successful goalie (whose previous three matches were shutouts) on the eve of the most important match since the 2004 Olympics qualifies in my book as stupid. On a positive note, D.C. United won last night! ahh…and soccer is my favorite sport (until my love of Frisbee overtook it)! i’m impressed you knew the women’s world cup was happening. i’d been following a little.